Your child is off to college in the fall. Should they pack a credit card along with the boxes and bags? Set ground rules. 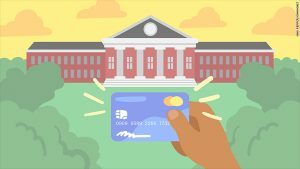 Agree on what the credit card may and may not be used for while at college. Put the agreement in writing and have your child sign off. Establish a budget. Talk regularly about how your kid is managing their expenses within the budget. Consider alternatives to a credit card, at least for freshman year. Consider using a prepaid credit card, or set up a checking account with a debit card. This may allow your child to gain experience managing expenses within a budget.